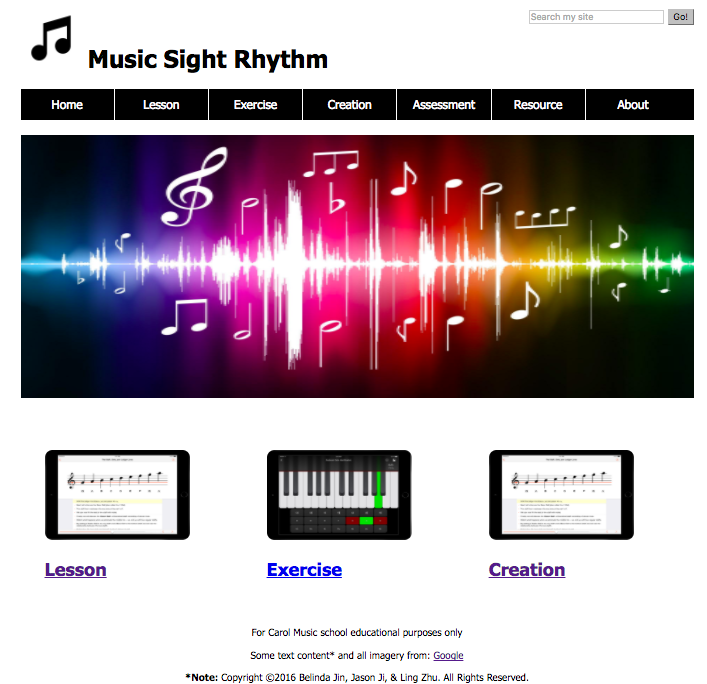 The Index Page (homepage) of Music Sight Rhythm will be very simple and easy to use, showing considerable respect for different levels of music learners. The straightforward design, with its white space, bright colours, and background images, will immediately catch the eyes of the visitors. 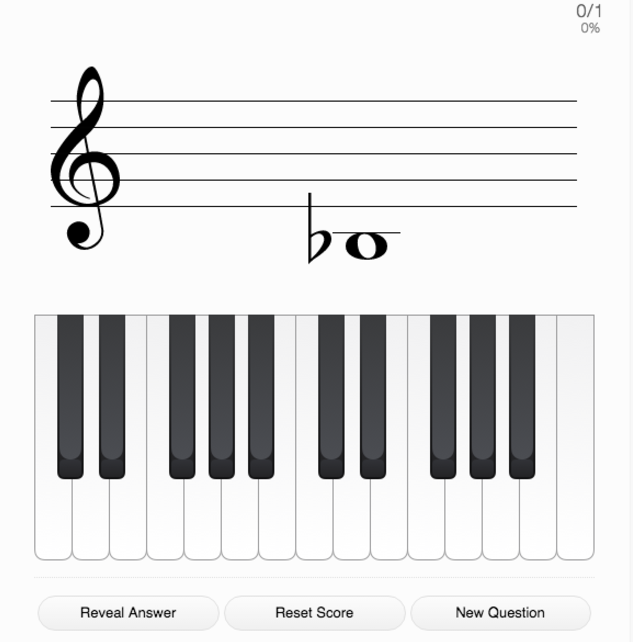 The homepage clearly indicates the three objectives (read rhythms combinations, play the three levels of exercises, construct own rhythms), that learners should achieve by the end of instruction, the overall styling is clean and consistent. This makes it easier for both educators and learners to understand of the content. The lesson page will be based on our first learning objective. 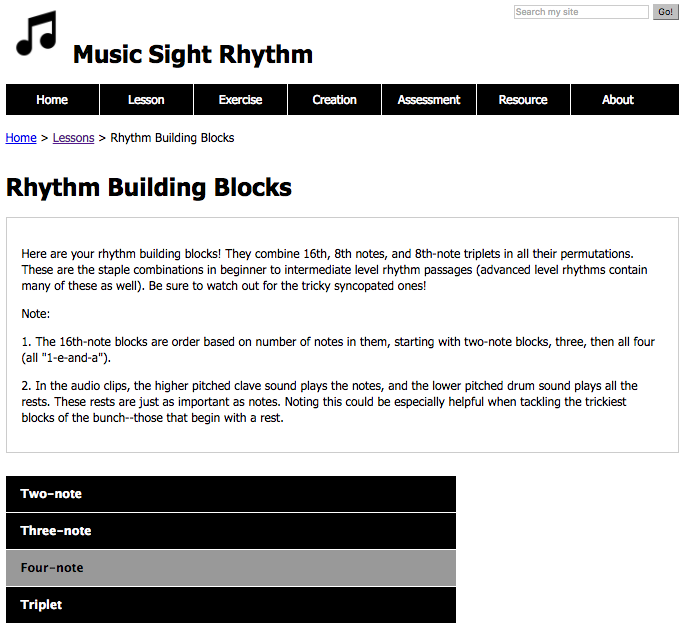 It provides introductions to rhythm building blocks. 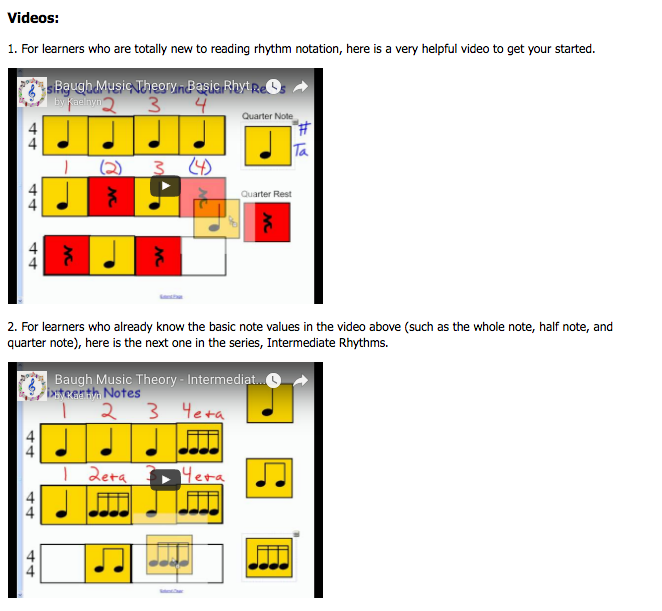 The vertical sidebar acts as a technical menu allowing students to choose specific variations of 16thnote, 8th-note, and 8th-note triplet combinations to aid them in understanding of rhythm building blocks. (audio clips provided!). The whole learning page is focused on simplicity. We will also provide simple visual, audio, and text, to illustrate how to read and build blocks. According to Donovan, Bransford, and Pellegrino (1999), “previous knowledge can help or hinder the understanding of new information” (p. 76). In this way, the three exercises that we designed reflected on “back to basics”, start from the basic level that clearly emphasizes to students the specification of the basics of sight rhythm, and progress all the way up to complete professional level. 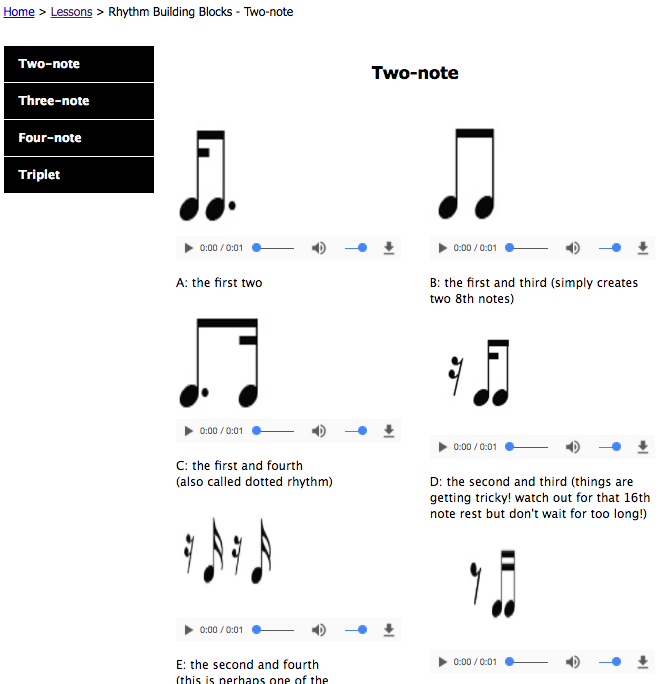 Students will have opportunities to practice sight rhythm on our site when they recognize different types of notes and remember the basic rhythms, which enables the knowledge and skill required for higher-level understanding and performance (Hannafin et al, 1997, p.105). 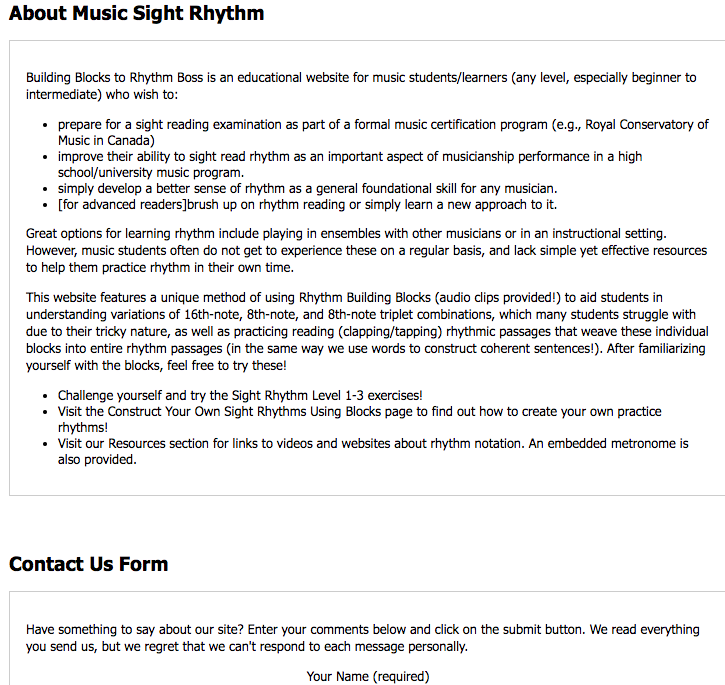 By practicing on our site, students can also construct their own sight rhythms using blocks, which show their “learning outcomes emphasize creativity based upon highly developed skills” (Simpson, 1972). Donovan, Bransford, and Pellegrino (1999) also state that it is important to transfer previous knowledge to new context in the learning procedure. In fact, the “transfer is affected by the degree to which people learn with understanding rather than merely memorize sets of facts or follow a fixed set of procedures” (Donovan, Bransford, & Pellegrino, 1999, p.55). 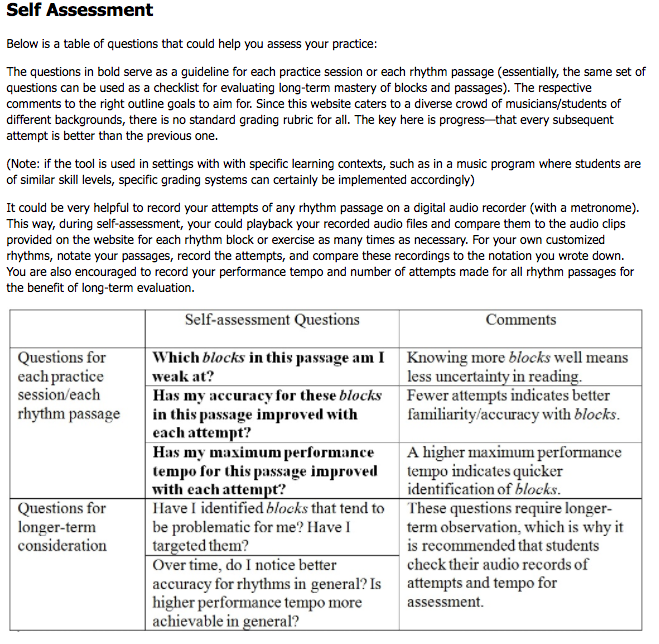 Ideally, the assessment page includes two parts: self assessment and instructor assignment. 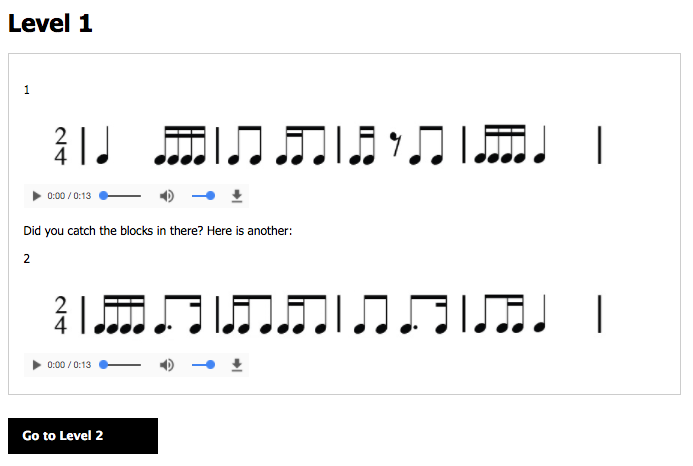 The website will offer both visual (rhythm notations) and audio examples along with suitable exercises, so students can use the audio examples as references for assessment and the exercises for solidifying what they learn, rather than simply trying to read rhythm off of a score. For the self assessment, it can be an effective way to prompt students to self – reflect and set their personal goals for learning and development; in addition, students can improve their meta-cognitive skills and use assessment as a learning device (Larson & Lockee, 2014). The instructor assignments can provide specific feedback to learners, which can identify and explain the various levels of skills that students have achieved (Larson & Lockee, 2014). The resource page provides extra resources for students. The resources can be an important tool (Feenberg & Barney, 2004), offering some useful links to external website pages and documents that provide some new insights and ideas to support students in this community (Feenberg & Barney, 2004) . More links can be added later on to expand the library of resources. The about page provides a detailed introduction to our website that will include the major goals of the site and how to use it. Additionally, we also provided the contact information of the main administrators of this website and the contact forms for users, giving feedback and asking questions about our site. This design feature allows members to leave messages to reach the web administrators directly. Based on the feedback and suggestions from the users (Schwen & Hara, 2003), we can also conduct analysis based on activity theory and make our decisions regarding updates to our website.